It was by chance that I discovered this bleaching cream called "Maldita Bleach". I discovered it through facebook. I am not obsessed of becoming fair or white or mestiza. I'm happily contented with my skin. Uneven skin tone is a sure problem due to genetics and too much sun bathing, yeah sun exposure, but other than that, I'm at peace with my skin color. But because of the too much rave about this bleaching cream, that is by the way Philippine made, I decided to give it a try. The price was between 180 pesos to 250 pesos. I'm not sure about the Maldita Bleach reseller price though. It is pricey if you ask me, because the container is way too big for what is inside it. One container should last you only 1 whole body application, I guess. You also need to do the bleaching process for 7 straight days and then you do the maintenance which is twice a week or so depending on the skin tone you want to achieve. Of course if you have a darker skin, it will take time for you to reach your desired "fairness". The Maldita Bleaching cream smelled like it has "Perla" soap in it. It is white in color. It looks like it has milk in it too. But the packaging doesn't really say what are its contents. I think, it should indicate the ingredients to inform the users of what they are putting on their body. The special ingredient may be kept secret though. Why am I saying this, it's because I just read that some popular beauty products like PONDS and OLAY have mercury. That is why I feel it is obligatory that the consumers be informed of what products are made of. I believe it is our RIGHT! Anyway, I decided to try the Maldita Bleach on my darker knuckles and feet. Not on the face, cause I'm afraid of any allergic reaction since our face has really sensitive skin. I tried the 7 day Maldita Bleach challenge. And the results? Well, it worked! The skin has lightened to about 2 shades lighter. It will take some more bleaching before those parts even out with the rest of my body. No itching at all during the 7 day bleaching period. You can actually see an improvement in the skin tone immediately thereafter. I still have some or should I say quite a lot of the bleach left. But it is all wasted now cause the cream has a life span of only 2 weeks according to my seller. I did hear they have manufactured new Maldita bleach with a shelf life of 3 months. I'm not sure though. Maldita Bleach works! But I won't be buying again. Why?First, I don't know the ingredients. 2nd, if one stops bleaching, eventually your skin will return to it's original skin tone. 3rd, I prefer all natural remedies for skin bleaching like lemon, potato, papaya, and milk. If you have any questions about this whitening/bleaching cream, shoot me a comment or an email. I'd be happy to answer your queries. thank you for the review. I'm thinking of buying it. i try to used it once a day then tommorow i remove the thick of maldita bench then its so pain why??? not so effective for me. but i tried only 7days on my armpit. Maldita bleach has hydroquinone i guess cause there is micropeeling effect. But when i try this for 7 days there is no peeling and id rather make my own DIY bleaching agent and it is 100% surely safe!!! I think your seller has informed you incorrectly. 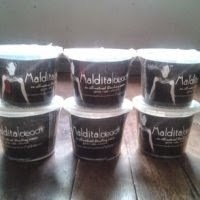 Maldita Bleach has 2 months shelf life from date of manufacturing due to its organic compounds kaya mabilis ang expiration. Old packaging at tingin ko old stock ang naibigay sayo. May new label packaging na po which indicate the ingredients and Mfg/Exp date. Its not really effective!!! Swear! Hi. Nag dry ba skin mo after 7 days? It is not effective my skin getting darker and burn..
is it ok to let the cream stay overnyt? Its more better to use baking soda and lemon to lighten your skin than Maldita bleach that is not truly effective. You are right,our skin is prone to allergy considering that the product we put on it wil be penetrated in our purse..just go for organic to prevent any skin problems.being beautiful is not necessary mean u have a whiter skin..u can achieve clear and glowing skin naturally maintain proper diet and eat lots veggies and fruits to keep your skin hyrated and moisturize..use apple cider vinegar for your face as toner to make ot glow ang healthy..
Home remedies not work for me. . I want to tty Maldita bleach but when I read this maybe I really need to think about it first. .thanks for the review.. Does it works on scar? Talaga bang hindi sya recomended. Maldita cause me so much trouble in my skin. I have a red like dots dots. It looks like nakaka allergy sya! 😔 OMG! Ang sama ng binti ko. I cant even wear sa shorts. That's scary when the company itself does not provide the full ingredients. But yet keeps reminding us that it's natural and safe. Then give the ingredients if it's 100% safe! Have you tried navarro's bleach? am not selling the product. but it should be at 180 pesos to 250 pesos. I used 2 containers of this, you don't leave the product on skin for more than an hour. It helps lighten skin, I used it for 7days everyday, then twice a week afterwards. It lightens my skin, even some dark spots/scars but I paired it with 3types of Nivea lotion. It doesn't have mercury, hyglocarin something, and another harmful product. It is on the label, you will see the shelf life and the ingredients. I saw natural ingredients so far. There is a mild lemon scent to it. Nabibili lahat ng ingredient ng bleach sa mercury drug store makakamura kayo kesa bumili ng navarro at maldita. have you tried using Modda Skin Body Bleaching Set?